If you wish to browse the Index for the Killarney Division November 1886 to c. May 1894 please do so by means of the Index button to the right. If you wish to browse the Rent Ledger for the Killarney Division November 1886 to c. May 1894 please do so by means of the Rent Ledger button to the right. A Searchable Database containing entries from both the Index and the Rent Ledger is under construction and will be uploaded as soon as possible. There are 3 steps involved in retrieving information from the rent ledger. Step 1. Please search for the tenant's Surname in the alphabetical index. 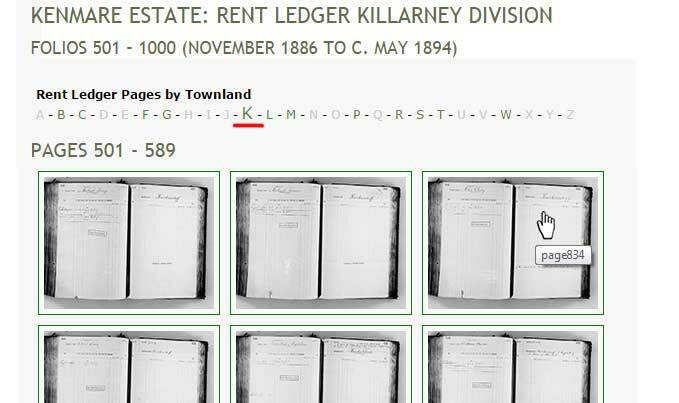 When located, please take note of the Townland Name and the relevant Page Numbers of the rent ledger as highlighted in red in the example below. (The link is located at top right of page). Please search under the first letter of the Townland Name to access the relevant page numbers as highlighted in red in theexample below. You will then need to search through the images to locate the relevant page number. Step 3. Click on the selected image to view.